Have an overall goal in mind. This might change for every conference. Most people assume they are they are there to get published. But let’s not get ahead of ourselves. 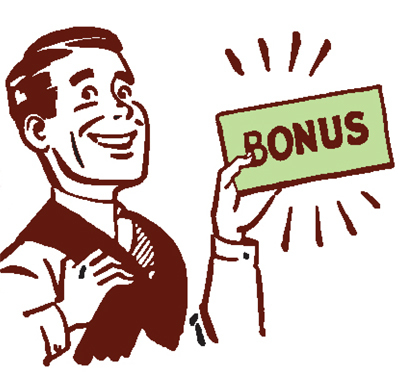 You’re not going to get a contract at the conference (seriously, toss that thought right now). Be realistic. Let’s assume you’re there to figure out how to get published. Try to break that down into measurable steps. Maybe your goal for that one conference is to find an agent, or to find out how to get an agent, or simply bust out of your comfort zone. OK. Can you make it even more specific? If you’re looking for in an agent, for example, what qualities or skills are important to you? Figure that out before you go so you know what to look for in the agents that are there, and you’ll be able to better size up and decide if anyone there is right for you. No sense submitting to an agent you don’t want to work with, right? If you want to break out of your comfort zone, list out two or three specific actions–like initiate a conversation with two strangers, attend that awards banquet by yourself, and/or refuse to sit in your room doing email every night. Get ready to smile and say hey. I hate the slimy connotations of the word networking, but conferences are really about the people. Otherwise you’d stay at home. What I mean by that is don’t just focus on the workshop topics, look at who’s teaching them. Read their bios. Try to read the book of the keynote speaker and/or whoever you’re taking classes from beforehand, so you know their background and you’re not coming in cold. That’s how you feel like a insider! By doing your homework you’ll feel like you already have an edge. Odds are you’ll be eager to meet the presenters. When else will you have the chance to meet them, and see what they’re really like? You can take just about any class online these days, but meeting these professionals in person? That’s why you’re there. Pack with a theme in mind. Not as in 1800s or hippy, but something that is consistent. It not only helps make packing easier, but makes it much easier for people to find and remember you every day, as well as afterwards. “I’m the one in polka dots” or “I was the one with pink striped hair.” You won’t be in the same thing everyday but people will start to recognize you by how you dress. I joke about lotion-ing up so you’re not remembered as the hand shaker with the rough skin. But bottom line: do your homework. 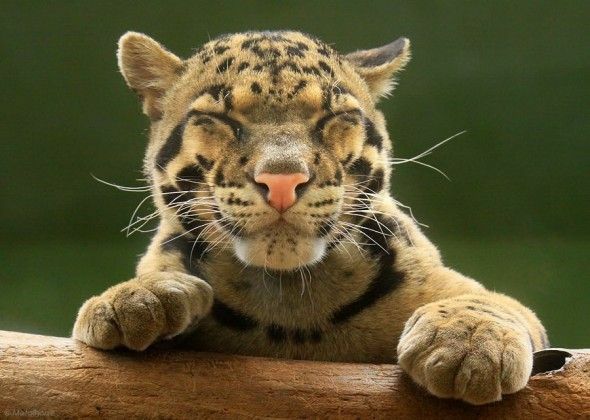 And get ready to smile. You’re going to have a great time! He’s following me, isn’t he? 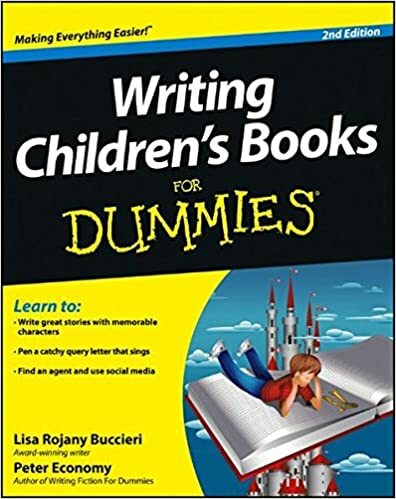 Looking for that perfect gift to give your writer friend? We’re a quirky unique bunch. As an author myself, I’ve amassed my share of “Here’s a notebook I think you’d like”s over the years. I’m not complaining! Any well-intended gift is sincerely appreciated. But if you’d like to wow the pants off of your writer friend (or just get an all-caps THANKS! ), here are some out-of-the-box, creative gift ideas. Some are standard but fun [wacky bookmarks] but others I guarantee you’ve never thought of before–and are–get this–free [book reviews]!! Please note I get no royalties or kickbacks from any of these external sites, and I cannot otherwise vouch for their awesomeness; I just happen to think they rock. Sure, anyone with kids has bookmarks climbing out of our ears and flowing off our desks…but do we have any creeping out of our books? Creative ideas like these are sure to please even your writer friend that MAKES bookmarks. Don’t let them wake the house when they are up late catering to their muse. This cool nightlight not only opens up to the shape of a book (see what I did there! ), it’s attached to a USB cable, allowing them to write by hand by plugging in their cell phone which is next to their bed anyway, or write on the laptop with just enough light to see the keys. This way they can stay in bed writing copious notes, or drift off to the side of the room without needing to turn on all the house lights to head downstairs. Great books on writing are super easy to order online and have delivered to their door (but of course I’m going to suggest you get from your local bookseller). Cheers to you, writer friend! Show them you have your full support, and that you believe in them, by buying them a bottle of champagne to celebrate their first/next/upcoming contract or milestone. It doesn’t have to be a fancy bottle, or break the bank. It’ll mean even more if you include a handwritten note of encouragement for them to reread when they are having a bad day. Give them time to get past redundancy and perhaps writers block, as they FINALLY LEAVE THE HOUSE to let those ideas simmers once they hit the yoga mat. Good energy begets good energy. Couldn’t we all use a little of that? 6. Buy their @%#! book! This may sound weird, because technically you aren’t giving them anything. But trust me–you are! Telling an author you just bought their book is like giving them a warm hug wrapped in chocolate cake (without the mess). If you already PAID FOR their book–not already have it–(which, unless you are their mom, sorry but I doubt you have), then buy another one to give to a friend or donate to a school library or teen shelter or neighbor. Even if you know you’ll never read it–they don’t need to know that. Support your friend fer pete’s sake. It’s Christmas! How can you not love artwork like the above, lettered on clear glass and matted in a circle? 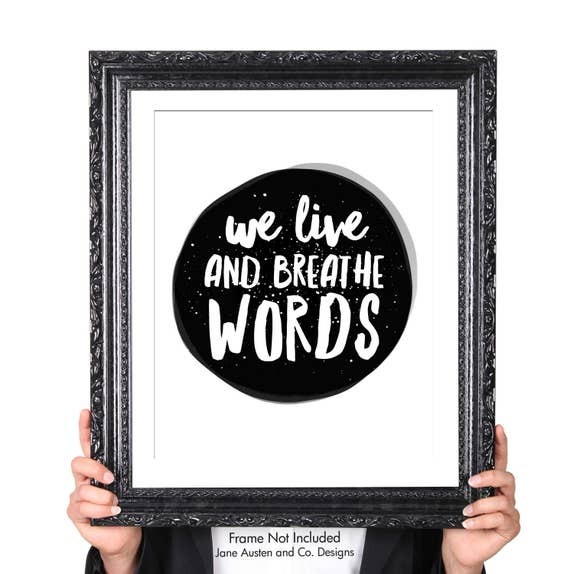 Head over to etsy for this mantra made by JaneAustenandCo, or pick your/their favorite quote and make your own. If you’ve got zero money in your pocket but want to give SOMEthing, give a book review! Did you know that the number of book reviews can help boost a book’s placement on websites like Amazon Books and general Google searches? The more reviews, the higher up it will likely show. Reviews of any kind are a HUGE factor, if not boost, to an author’s success. Even if they aren’t glowing reviews! A review shows the book has been read. And that the reader took the time to review it–which means it made an impact on the reader. In fact, a mention of the book in any form of social media is welcomed. I mean, who can’t give a free gift? Just make sure you’ve read the book, and make it a genuine review. Websites are cracking down on what they perceive to be “buddy reviews” and are deleting them without warning. Give a fair review. I mean sure–round up on the number of stars by all means–just don’t go too overboard on the comments or it’ll come across as fake. No one wants that, not even for the holidays. If free is the only way you’re going this year, at a minimum, check out their book from a library–or ask your local library to carry their book (and tell your friend you did so). It might not seem like a big deal, but checking a book out of library, or even taking it off the shelf and having a librarian re-shelf it, can make a big difference in how long a library keeps a book. This is how a California librarian explained it: “If a book has not been checked out in a certain number of months, it gets chucked. Yep. And then [the] book will be gone from the system, forever.” Sad, right? She went on to say, “Basically, librarians are always actively looking for books to ‘weed.’ They have to get rid of books on a regular basis to make room for new ones coming in. If they find a book that hasn’t been checked out for ages, and it’s a book they love, they might put it on display or do something else to increase its circulation. But they might also just decide this book has lived its life, and because there is no demand for it anymore, it’s time to pass it on. Sad but reality. ” So check out your friends book(s)! Scarves, leggings, pins, you name it. A friend bought me a scarf that has banned books listed/crossed out. I sometimes wear it as a skirt–see above (writers are the creative type afterall). 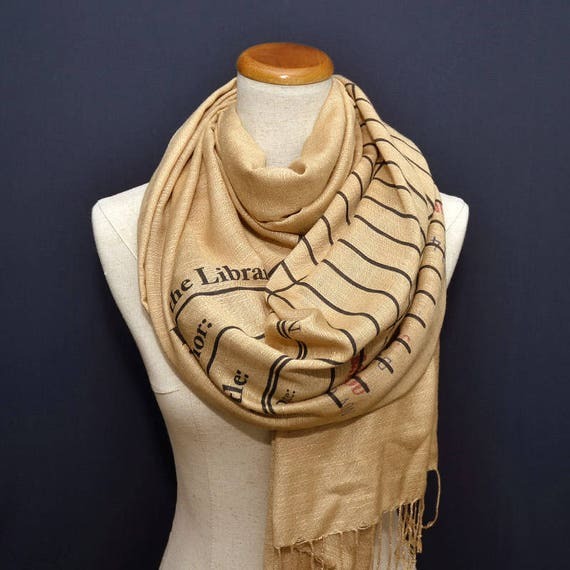 Other scarves have bookshelves [found on etsy, Amazon and Zazzle], ones with the text from your favorite novel such as the Alice in Wonderland scarf and other classics from storiarts, and ones (like above) that look like a stamped library due-date card. Google “books scarf” or “word scarf” or a similar combination and you’ll be amazed at the selection. Order now, though, as many are special order (and most likely worth it). Then there are ADORABLE pins like a set of images from The Little Prince Book from Out of Print (typewrtiters, Edage Allen Poe with a Santa hat, oh…too many too list). They can go on the scarves or be standalone gifts–they are small in size but sure to win over any heart. Leggings are fun too. I will warn against ordering leggings online without checking their material and reading reviews. I ordered a pair from a company that rhymes with Brave New Rook and while I’m sure the company is full of wonderful people, their leggings are HORRIBLE quality (100% polyester) and there was no way to tell from the their website how awful they’d feel or look in real life. The stitching is atrocious. The fact that there was only one review should have tipped me off. [They also took weeks to arrive but that’s another story]. You don’t have that issue with scarves so I’m thinking they are a safer sight-unseen purchase. And scarves look so classy! All these suggestions are conversation starters too. Many writers are introverts so any are a welcomed party accessory. Sign your writer up for a class, a workshop, a conference. I love SCBWI (Society of Children’s Book Writers and Illustrators) and it’s one nonprofit I can vouch for. Why not buy your writer an annual membership? It’ll last all year long (join SCBWI). Everyone has a chapter near them (check here for where yours might be) and every region hosts local events, meet ups, etc. Kidlit411 has no membership fee, and offers a list of reputable places to look for events/conferences/workshops practically worldwide that might be wroth signing them up for. Other online and/or downloadable classes seem to be cropping up daily. Most are hosted by solid industry professionals and offer sessions year round. Just carefully investigate the credentials of who’s presenting, and comparison shop for prices. SCBWI tends to offer stellar webinars throughout the year, for example, for $10 or $15 members (only $20ish for nonmembers). Have a look at some upcoming ones here — check back often for updates. Make sure the topic is a good fit. 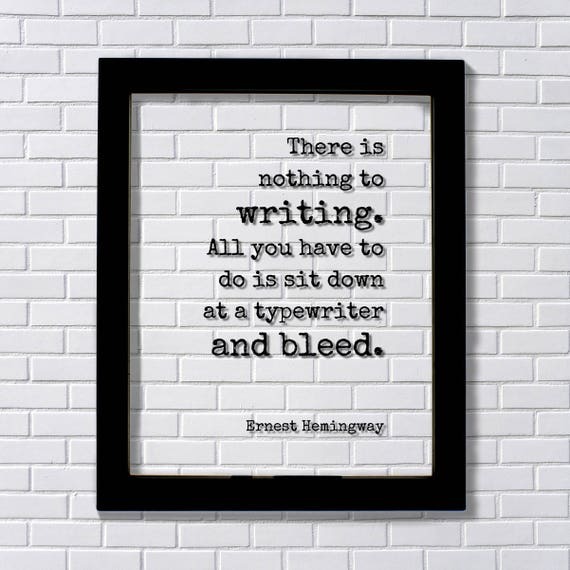 I mean, don’t get your writer a workshop on editing if they haven’t even written their story yet; if that’s their situation, suggest they take a beginner’s class on how to write or how to get started first. Jewelry is a slam dunk most of the time. So is anything Harry Potter. Harry Potter jewelry? Oh my. Then there’s simple bracelets like the one above, with bookish sayings, for $14. For your writer/illustrator friend, here’s a great crayon charm necklace for only $12! They’ve got it with typewriters too. Plenty of jewelry out there for all tastes. Google key writing-type words or phrases and add “bracelet” or “necklace” to see what crops up. There’s lots. We could all use a helping hand when it comes to making our writing better. Why not buy your writer a professional critique of their work? [Note: NEVER do this on the fly. 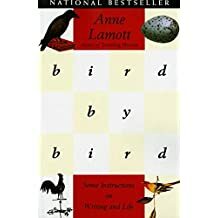 ONLY go with a reputable, experienced author who you’ve gotten recommendations from. (What have they published recently, by what publishing house, to what acclaim? If you’ve never heard of them, get names of people they’ve critiqued for and see what they say.)] Here are some writers I can vouch for. There are plenty of others too! These are literally off the top of my head. Check them out yourself–carefully! You want to make sure you get the best fit for your specific work. Nothing I like better than supporting small businesses, especially when they have quality goods. This one even has a “Gifts for book lovers” page! I know, I know, the last thing we need is another book bag, but the book-themed tees are super cute. Anyone can find a crass shirt with text. Why not find a pretty one they WANT to wear, and can wear anyplace? Since I’ve purchased from this vendor before, she’s kindly offered up a 20% off for anyone to use as much as they want: KEMPER20 (and no, I get no profit or benefit from your purchase–I just like her stuff). Regardless of what you get your writer, knowing you shopped with them in mind will make all the difference. They will love you went out of your way for them! I’m betting some of these you haven’t thought of. And maybe you’ll give one (or two?) a try? No excuses to not do SOMEthing! You may have wondered if Work For Hire is right for you. If you’re considering writing in the children’s book industry, I’ve created a quiz that might help. It’s based on my personal experiences as well as several colleagues I interviewed. [To give you some perspective on collective experience that I’m drawing from: I’ve written 16 kidlit titles for hire so far; picture books, chapter books, and YA–most of them as part of an existing series where the other titles were written by several other people. The fellow writers I talked to have authored close to 100 for-hire titles total.] We’ve all written for different editors and publishers, on different topics, in different genres, with different parameters. Every contract was in some way unique. But generally speaking, Work For Hire has similarities that differ from traditional publishing. Sometimes you work directly for a publisher. Sometimes you work for a middleman, called a book packager or book producer, who in turn works for the publisher. The book or series might be your idea, but is more likely their in-house idea that they are hiring out for–usually part of a series such as early readers featuring popular TV characters like Spongebob or a history series for K-3rd grade. Bottom line is: you write it, they own it. Can you work with a pre-existing format, one you didn’t create? Can you write in someone else’s voice, and/or match the general tone/voice and target age range of an existing series? Are you good at research, note taking, keeping files of resources and interviews? Can you handle someone else telling you exactly what needs to be done, then possibly changing gears midstream? Are you okay with the fact that even though it has YOUR name on it, the contents and everything about it may not have been your preference or decision? If most answers are Yeses, you might be on the right track. If most questions made you clench, well, relax. Before you get too nervous, know that the publisher isn’t out to screw you. They don’t want to mess up your work on purpose. Their goal–like yours–is to get the best possible product in the hands of their customer/reader; but the main caveat is it’s usually the best product possible created in the shortest amount of time. You might disagree on what the best product ultimately looks/reads like. (It doesn’t matter though. They have final say. On everything.) Just know they really do have the best interest of the customer in mind. They want to sell books! This is their business! They fully understand a crappy book won’t sell as well as a well-written one. They don’t want to put their reputation on the line for shoddy quality. They have your back; their name is on the cover, too. Do you like direct feedback on how to make your assigned work better? Do you like researching and choosing which publishers and packagers you work with? Do you like learning about new topics you may have never considered writing about? Do you want to get published?! If you took this quiz and are a yes (wo)man, then Writing For Hire is for you! Give it a try! How to go about finding Writing For Hire opportunities will be the topic of my next blog… Hint: it takes just as much effort as pitching your current manuscripts! But worth it. If you’ve had experiences similar or in contrast to these Quiz questions, tell me about in in the comments. I love hearing anecdotal WFH stories. There was a big College Information Night at my son’s high school. There are still years to go before he’s ready, but he’s a planner. Approximately 50 reps from colleges all over the country were there. They ran from big and big name schools (UCLA–the most-applied to school in the entire Unite States) to so small I don’t know how else we would have heard of them (Holy Cross–921 students, total). We talked to lots of them, asking most of the same questions about GPA needed, acceptance rate, majors offered, class size, etc. The school my son most wants to go to had one of the biggest lines (guess others want to go there too). We waited quite a while to talk to the rep, who patiently repeated the same information over and over. (Seriously, why weren’t the parents just listening in while they were in line? But I digress.) While we waited, we grabbed their college brochure and started flipping through it. We noticed some more obscure majors listed for the school, ones my son was sorta interested in, and wondered if applying for one of those would make sense, instead of those which were sure to be the most popular/crowded/competitive. So we asked the rep, if our son were to major in, say Japanese, would that up his odds of getting accepted, as opposed to him majoring in engineering. The rep waited not even half a second before answering flatly: “Major what you want to major in. Don’t apply to something you aren’t interested in.” And we felt stupid for considering it, or even asking about it. I did, at least. Now bear with me as I cut over to Manuscript Wishlist, an amazing resource where editors and agents tell you EXACTLY what they are looking for. And I mean exactly. It’s a website as well as a “hashtag” (which means you can do an internet search for “#mswl” and up will pop the most recent posts about it). It’s fantastic because if you are working on a book, say, about kids and frogs you can type in “#mswl kids frogs” and see if there is an editorial match. If so, you know who you should add to your sub list! The more specific the less likely you’ll get a hit, but hey it’s worth a shot. One recent post from an editor, I swear, read “High-tech elves with internet while everyone else is trying to figure out the Iron Age.” It’s that specific. Scanning the posts or website can be a fount of inspiration. Even if you don’t find a perfect match for your current work-in-progress, it can give you manuscript ideas. Knowing there is someone waiting for that topic/character/etc means you’re one step closer to acceptance! I’ve found myself creating and re-creating all kinds of story ideas from trolling around. Sometimes, I’ll see an element an editor shares about him or herself, and I’ll add that character tag to one of my main characters just so I can add in the cover letter, “Emma loves jelly beans just like you.” I’ve raced to complete a final product since I can almost taste the sweet reward of publication from an already-ready editor. Any edge helps, right? But here’s the rub. It’s never panned out. The problem is, those stories I was working stories weren’t really my stories. The ideas weren’t my ideas. Even if I can run with a concept, my heart isn’t in someone else’s idea of what makes a great plotline. Just like picking a major just to get accepted at the school you might want to get into, a school you might not otherwise have a chance at, writing a story just to get published at a house that might not otherwise notice you is a waste of time. No one wins. Not you, not the editor or agent, and not the story. I hope I haven’t been wasting your time with this analogy. All this is to say: write the story you want to write. Write the story you need to write. Don’t waste your time writing the story that you think will get you a leg up in the industry. Keeping The Old, With New Modern Twists! We all know the classics fairytales and storybook rhymes our grandparents taught us or read to us. But do our kids know them? Unless it was made into a movie or TV show, maybe not. If our kids have heard the rest of them, they probably think they’re dated. The challenge: How do we keep these classics, and traditions, alive? We make them relevant to today’s world. When I think of storybooks or fairytales, I think of a cosy, dusty old room in the back of my grandparent’s house, where my grandmother kept the kid toys we’d play with and books we’d read over and over again when we stayed at their house. There was one book, in particular, that was thick, with gold-rimmed pages (so fancy!) and lots of, well, really weird pictures. Cats wearing tall black boots and kittens wearing mittens and butchers, bakers, and candlestick makers. The stories were crazy too. A man that ate pumpkin all the time. He put his wife in a giant one! A lady that had so many children she didn’t know what to do. And get this — they lived in a shoe. A shoe!! A cracked egg that even kings couldn’t help. Princesses. Oh, the princesses. And riches beyond reason. I couldn’t get enough of that book. I read those pages over and over, the gold trim slowly fading wherever I tended to touch the most. 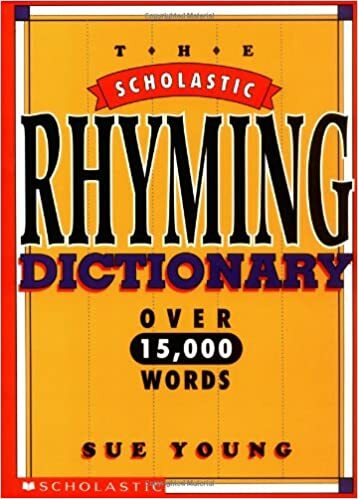 The fact that my grandmother had so many of those rhymes and stories memorized blew my mind. How did she do it? Year after year I realized she did it the same way I was doing it…by hearing them read over and over by my grandmother. She must have had them read to her over and over by HER grandmother too. As I grew, I was reading them on my own, over and over, to the point it became ingrained in my brain much the same way I can still remember her home phone number (Mohawk5–1104). Those stories aren’t just something written in a book, they are something I shared, and treasured, with my grandmother. I grew up without a mom, so she was the closest adult to me, and that bond over reading is absolutely life changing and irreplaceable. Parent to child, or grandparent to grandchild. That’s how tradition becomes tradition, and classics become classics. Yet somehow, we’ve lost that sense of tradition. The classics, unless they’ve been turned into a movie, Broadway musical, or (often unbearable) TV show, are no longer retold. Don’t get me wrong — I understand why. 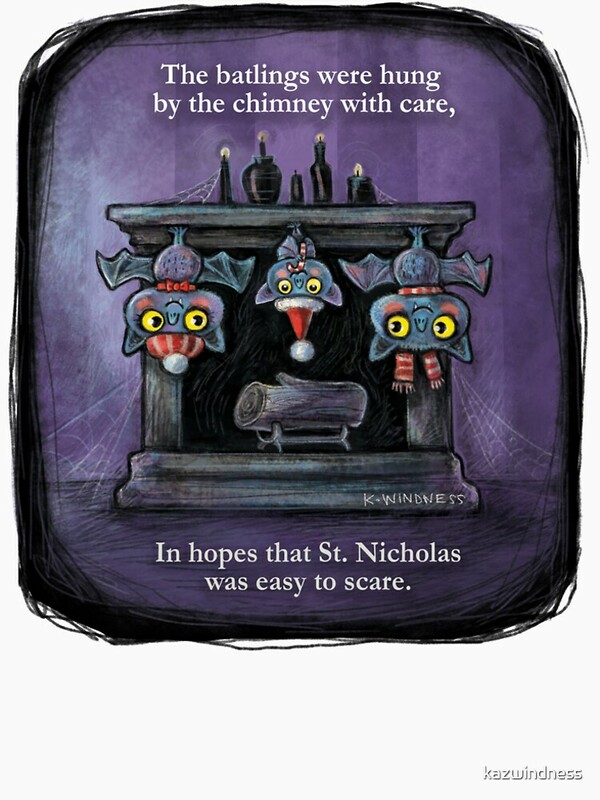 Those classics are often horrifying! They’re awful, and weird, terribly politically incorrect, and not something I ever read to my own kids. Lots of kids getting eaten. Child brides. I mean, some versions of the original Sleeping Beauty are so horrific, I can’t even tell you. And the very beginning of the Snow White movie when the queen sends the squire to bring back Snow’s White’s HEART?? Oh my gosh, when I bought that CD for my daughter I had to fast forward through that part every time, I had completely forgotten. We have to admit the classics might not be worth retelling AS-IS in today’s modern world. I think we as parents realized we didn’t want our kids hearing that stuff anymore, and we stopped retelling the stories. What happened in the meantime is someone else started telling our kids stories. Some one, or some thing. Our kids are watching these stories on TV or on their iPad or reading it piecemeal off someone’s Twitter feed. They aren’t sitting on our laps anymore. Or not as much as they could be. I think it’s time to take lap time back. Take those classics back, too. But hang on a second, let‘s turn those classics on their heads. Make them fun and relevant — something a kid today WANTS to listen to. Something that both parents AND kids can have fun with. That’s why I wrote the Bedtime Stories series “Kid Joey: Fairytale Detective” They take conventional storybook rhymes and fairytales, but add a twist. So the story you THINK you know, the story you’ve heard over and over, has a new ending or new twist, or new angle — with lots of laughs along the way. It’s fun for adults because they don’t know the ending or details either, and they get to experience the story in a new way, together with the child. What’s extra fun about the series is it gives parents, grandparents, and caregivers the chance to open up a dialogue about the old fairytale and storybook tales. Maybe it‘s the chance to tell the story for the first time. For example, in one story, Jack Spratt is mentioned, but no reference to him eating no fat and/or his wife eating no lean is brought up. Ask your kids “Do you know who Jack Spratt is?” When they say “No,” which they are bound to reply, pause for a minute and recite the silly rhyme. Share the story with them. Embrace that laptime. We all know it’ll be gone in a flash. Let’s start the conversation back up, and have fun doing so! You may have seen author Bitsy Kemper on CNN, profiled in Writing Children’s Books For Dummies, or in literally hundreds of American TV news programs, newspapers and magazines. Maybe you passed her at the airport and didn’t even know it! Author of over 16 books, from picture books to chapter books to YA, she has enjoyed resuscitating old fairytales and bringing Joey to life in these (hopefully charming!) bedtime stories. She enjoys dark chocolate, yoga, and church — but is careful to never indulge in all three at the same time. Busy raising three kids (four if you count her husband), she loves presenting at schools, libraries, and conferences all around the world. Find out more at www.BitsyKemper.com. I love reading posts about gift ideas. Heck, I love shopping, and thinking about shopping, and yes, being on the receiving end of shopping too. As an author, over the years I’ve amassed my share of journals and pen sets. I’m not complaining! But here are some out-of-the-box, creative gift ideas for the writer in your life. Some ideas are somewhat standard [wise*ss t-shirts] but I guarantee some you’ve never thought of before–and are–get this–free [book reviews]!! Please note I get no royalties or kickbacks from any of these external sites, and I cannot otherwise vouch for their awesomeness; I just happen to think they rock. How can you not love artwork like this, lettered on clear glass or matted in a circle? Head over to etsy for this quote by Hemingway or one made by JaneAustenandCo, or pick your/their favorite quote and make your own. 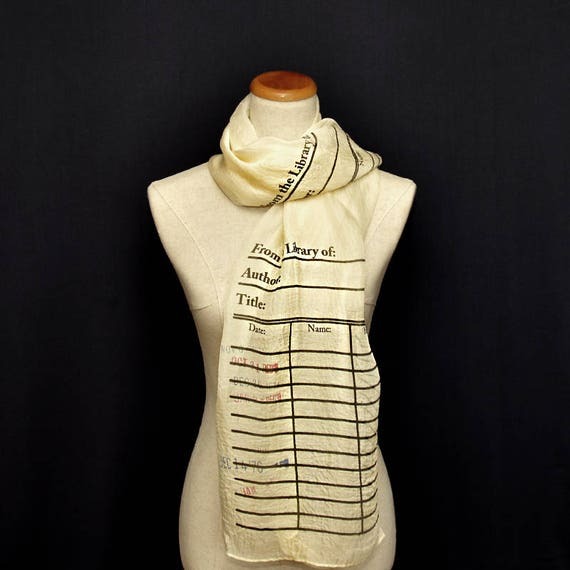 There’s an Alice in Wonderland scarf and other classics from storiarts, and lots of other very clever book scarf options like this one that looks like a stamped library due date card from etsy and a bookshelf scarf from cafepress. There are a ton of options, actually. Google “books scarf” or “word scarf” or a similar combination and you’ll be amazed. Order now, though, as many are special order (and most likely worth it). I will warn against ordering book leggings online–that is, leggings with cute images of books on them. I ordered a pair from a company that rhymes with Rave Rew Rook and while I’m sure the company is full of wonderful people, their leggings are HORRIBLE quality (100% polyester) and there was no way to tell from the their website how awful they’d feel or look in real life. The stitching is atrocious. [They also took weeks to arrive but that’s another story]. You don’t have that issue with scarves so I’m thinking they are a safer sight-unseen purchase. And scarves look so classy! Such a conversation starter too. Many writers are introverts so it’s a welcomed party accessory. 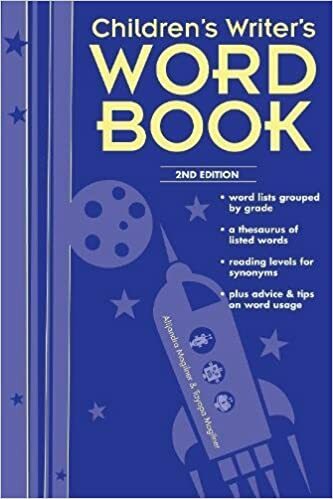 (You might wanna steer clear of that last one as a gift, given the title and all, even though it’s really a fantastic book for beginners!) Shout out to JEN Garrett for most of those craft book suggestions. Grab one of these, just for fun. A beautiful and clever (but, yeah, expensive) reading light. Get bombarded with great ideas in the shower? 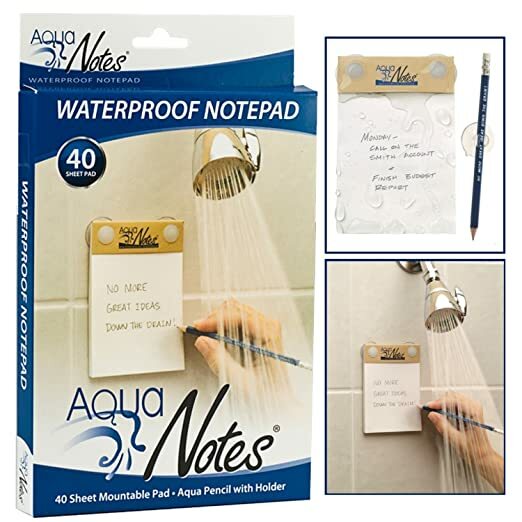 Write ’em down with a waterproof notepad found on Amazon. How many classic novels have you read? Keep track with this slick scratch-off poster. 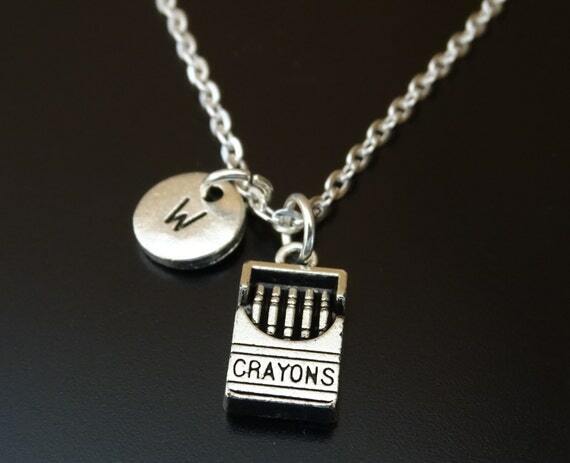 For your writer/illustrator friend, here’s a great crayon charm necklace for only $20. They’ve got it with typewriters too. Here are some writers I can vouch for. There are plenty of others too! These are literally off the top of my head. Check them out yourself–carefully! You want to make sure you get the best fit for your specific work. Regardless of what you get your writer, knowing you shopped with them in mind will make all the difference. As gift-giving expert Lisa Bader from http://www.wrapwithlove.com says, “When it’s all said and done, the particular gift you give isn’t what matters most. What matters most is how the particular gift made the recipient feel.” They will love you went out of your way for them! If you’ve got zero money in your pocket but want to give SOMEthing, give a book review! Did you know that the number of book reviews can help boost a book’s placement on websites like Amazon Books and general Google searches? The more reviews, the higher up it will likely show. Reviews of any kind are a HUGE factor, if not boost, to an author’s success. Even if they aren’t glowing reviews! A review shows the book has been read. And that the reader took the time to review it–which means it made an impact on the reader. In fact, a mention of the book in any form of social media is welcomed. As author Lori Mortensen puts it, “Social media makes a difference, so if you have a moment, leave a review on Amazon, Barnes and Noble, Goodreads, or other social media for your favorite books. Authors everywhere will appreciate it.” I second that! I mean, who can’t give a free gift? Just make sure you’ve read the book, and make it a genuine review. Websites are cracking down on what they perceive to be “buddy reviews” and are deleting them without warning. Give a fair review. I mean sure–round up on the number of stars by all means–just don’t go too overboard on the text or it’ll come across as fake. No one wants that, not even for the holidays. Sooooo…Even if you’ve read their book (which, let’s be honest–you probably haven’t), you can check out your friend’s book(s), and return the next day, just to get that title recorded. I know in my library they track which books have been interacted with, so even taking it off the shelf and placing it on the “go back” cart gets it recorded or noted as someone having paid attention to it. Now, if your library doesn’t carry the book, put in a request for them to purchase it. Talk to whoever is at the desk about it. They might not be able to, but you’ve planted the seed. Maybe someone else already has, or will, and your request will make the difference. 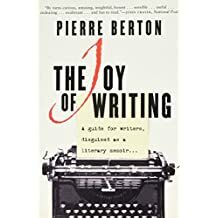 These are great gift suggestions for writer friends you don’t well enough to go out and buy something for, but that you’ve admired or have enjoyed getting to know over the years, perhaps virtually via the magic of the interwebs. <cough cough, points to self> Neither takes much time to do, they don’t cost any money at all, and the effects are longer lasting tan any scarf or book light. Your writer friend will be thrilled!